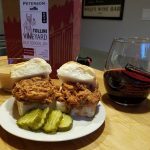 Denise Stewart’s Pulled Pork Sandwiches with Homemade BBQ Sauce and Secret Topping Sauce | What Goes with What? The pork is great in the BBQ sauce alone and the secret sauce is a tad hot and frankly doesn’t really add to the flavor profile but it may be more to your taste. Prep time: Advance preparation required. Spray entire inside of crock pot with Pam cooking spray then place sliced onion in the bottom of the crock pot. If using garlic make small slits all over the top of the roast and insert the cloves. In a small bowl mix all dry seasonings together, then rub over the top of the roast. Place the roast on top of the onion and fill the pot to a 2/3’s level with beer/water. Cover and set the Crock to low (275) and cook for 8-12 hours or overnight. Combine all ingredients for the barbecue sauce then bring to a soft boil for 6 minutes. Set aside. When the roast is finished remove it from the pot to a sided tray or large platter. Discard anything else in the pot. When pork roast is cool enough to handle, use your fingers or two forks to pull it apart until the entire roast is shredded. Return the pulled pork to the crock pot. Mix in the BBQ sauce and cover then cook on medium high for 1 hour or until the flavors meld, even better if made the day before you plan to use. Mix the ingredients for Denise’s Secret Sauce thoroughly and taste as it’s a bit full flavored, add a touch more ketchup/mayo to soften. If making a lot of sandwiches put sauce in a squeeze bottle for topping, a little goes a long way. Serve barbecue pork on soft sourdough buns and topped with a touch of Denise’s Secret Sauce.